The Controller Area Network (CAN or CAN-Bus) has been invented for use in vehicles (cars, trucks) to reduce the complexity of the cabling systems and to allow the control of different sensors and devices. Because of its reliability against noise and transmission errors the CAN-Bus is also used as an industrial "Fieldbus". Today CAN-Bus is mainly used to control factory automation for many different controlling and data acquisition applications. CAN-Bus is a broadcast bus with differential serial data transmission, where the bits are being send in NRZ coded frames. The frames consist of an ID to identify the sender type and up to 8 data bytes, the frame is sensed from all CAN-bus nodes. A CAN network can be configured to work with two different frame formats: the standard frame format has a 11 Bits ID (CAN 2.0A) whereas the extended frame format uses 29 Bits ID (CAN 2.0B). CAN-Bus features an automatic 'arbitration free' transmission. A CAN message that is transmitted with highest priority will 'win' the arbitration, and the node transmitting the lower priority message will sense this, back off and wait. Using the VScom CAN adapters a PC can be connected to the CAN Network in a simple manner: over USB, over a serial port, over Ethernet or over a PCI Add-on card. All VScom CAN adapters support both CAN 2.0A and CAN 2.0B frame format to fulfil the task of controlling and monitoring. The PC can in the same time additionally log the data and status of the CAN-bus, without interfering with the control application. CANHacker, a tool for analysing and transmitting frames on the CAN BUS, is included in the product package. The CAN adapters also support CANFestival, an Open Source CANopen Framework. CANopen is a CAN-based higher layer protocol that is used in various application fields, such as medical equipment, offroad vehicles, maritime electronics, railway applications or building automation. CANopen unburdens the developer from dealing with CAN-specific details such as bit-timing and implementation-specific functions. It provides standardized communication objects for real-time data, configuration data as well as network management data. • The PCI-2CAN cards are placed into a PCI slot. As a universal PCI Add-on cards they operate in classic 5V PCI slots as well as in newer 3.3V PCI slots (PCI-X). The card adapts to the main board and generates appropriate signals. The two CAN channels are placed on the bracket, so the card occupies one slot only. The drivers for Windows operating systems install two serial ports (Com Port), one port for each of the two CAN channels. This COM Port is then used by the software to transfer data and commands to the CAN-bus. Hardware-based automatic flow control of the COM Port ensures the reliable data transmission, i.e. no data losses to/from CAN bus. Also under Linux OS the drivers emulate a serial port. Because the drivers implement a serial COM port, the users may use a terminal program for data transmission and control. The binary data of CAN bus are converted to an ASCII-format, they are sent in this form. This modus may be used manually, to simply test the equipment in the installation phase. Also dedicated customer applications can use the terminal mode. However this is an effort, which is not necessary to be done. Instead the customer applications can use the supplied CAN frame library (VSCAN, a DLL in Windows), which automatically packs the application data and commands into the CAN bus frame data format for send, receive and control/status commands. Using the CAN frame library the user can focus on his real application, and don't care about the frame data formats. The CAN Frame library is developed to be compatible with future VScom CAN products. 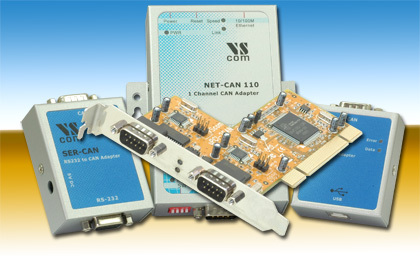 • The NET-CAN adapters provide CAN BUS communication over Ethernet. They provide completely secured communication for both data transfer and configuration to the attached CAN devices. NET-CAN supports two operating modes: Driver Mode and TCP Raw Server. The Driver Mode basically requires the installation of the virtual com-port driver, which makes the network fully transparent for the application. The TCP Raw Server Mode doesn't require the virtual com-port driver installation, so the communication will be handled directly via IP address and port number (i.e. socket programming). As with PCI-2CAN the virtual serial port and the direct TCP connection can be used in ASCII mode for CAN operation. But the VSCAN library supports the virtual serial port operation as well as socket programming, so customers application software does not have to care about those details. Changing the CAN connection from one model to the other just requires a new configuration for the port to use. • The USB-CAN adapters are connected to a PC via USB 2.0 and support data speeds up to up to 1 Mbit/s over the CAN Network. Also USB 1.1 with the Full Speed data rate of 12 Mbit/s is sufficient to operate this device. Therefore even older computers are suitable for CAN operation. The new USB-CAN P adapter comes with a lightweight and compact plastic case, while the USB-CAN provides an industrial metal case with DIN-Rail mount capability. The drivers for Windows operating systems install a virtual serial port (Com Port). Like the drivers for PCI-2CAN a hardware-based automatic flow control of the COM Port ensures the reliable data transmission, i.e. no data losses to/from CAN bus. Also under Linux OS drivers emulate a serial port, with secure flow control as well. Further the CAN function uses the serial COM port in the same way as with PCI-2CAN and NET-CAN. So the use of terminal program, ASCII mode and VSCAN library is supported in the same way. The power supply of USB-CAN is provided via the USB port, which results in minimum cabling. The low power consumption is an additional advantage. • The SER-CAN adapter is similar with the USB-CAN adapter, but it is connected directly to an RS232 serial port of any computer. The SER-CAN adapter has the same specifications concerning CAN bus interface and operates the drivers in the same way as USB-CAN. The SER-CAN adapter uses the same CAN frame library as interface for native CAN frame format. The RS232 interface limits the maximum data speed on the serial port side, but the adapter can be configured to filter frames based on certain information, so it only accepts the matching data. This feature, optionally combined with suitable higher level protocols, can significantly reduce the required data throughput. Further the SER-CAN uses RTS/CTS flow control to guarantee the error free data transmission. The SER-CAN is powered by 5V DC external power. A suitable wall-plug adapter is part of the packaging. CAN BUS adapters are available at a very attractive price.